For the newer MD-10 from the it0uchpods Design Group, see IDG-MD-10X. The McDonnell Douglas DC-10 is a three-engine wide-body jet airliner manufactured by McDonnell Douglas. The DC-10 has range for medium- to long-haul flights, capable of carrying a maximum of 380 passengers. Its most distinguishing feature is the two turbofan engines mounted on underwing pylons and a third engine at the base of the vertical stabilizer. The model was a successor to McDonnell Douglas's DC-8 for long-range operations, and competed in the same markets as the Lockheed L-1011 TriStar, which has a similar layout. 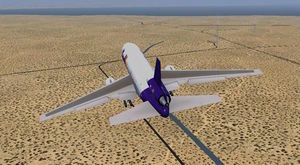 In its early years the DC-10 had a poor safety record; however, this has greatly improved over time. See the right InfoBox for the Repository, or Download. Remember to rename the aircraft's folder to "MD-10". Livery Select may not work under some conditions.